Aries Inverters are designed on the latest State of the art technology. Controlled charging ensures longer backup, reduces topping & enhances battery life. Best suited for most of the equipments specially designed to provide longer uninterrupted backup for varied applications from homes to schools, offices, institutions, medical, petrol pumps, telecom railways, defense & many others. Special designing ensures lesser losses increasing the overall efficiency of the units. Fast charging options available on request for areas where frequent power cuts is a routine affair. Aries Inverters cover all the necessary protections that are required from an Inverter. 3 phase equipments viz. Lift, Motors, compressors, process machines, Air conditioners run when the 3 phases are connected in the right sequence( RYB ) & the phase angle of 120° between each phase is maintained. In case the phase sequence changes the motor tends to rotate in the reverse direction. In case of Lifts, Air conditioners, or other process machines the load will stop functioning because of inbuilt protection & these equipments resume only when the sequence is corrected manually. In case of 3 phase UPS ( Uninterrupted Power Supply) the UPS starts functioning on the battery mode & drains the batteries even when the power is available but only the sequence changes, effects battery life & lowers battery life. By installing the ARIES Electronic Auto Phase Sequence Corrector all these problems donot occur under any circumstances irrespective of any sequence in the input. In the case of 3 phase UPS, due to wrong sequence, the input supply will be cut and it starts working in the battery mode resulting in discharge of battery. SWIFT – ELECTRONIC AUTOMATIC PHASE SEQUENCE CORRECTOR always gives an output 3 phase supply in the right sequence and maintains 120° between phases, even if the input sequence is interchanged. Thus all the 3 phase equipments continues to run irrespective of the change in input phase sequence. We are specialized in manufacturing export quality isolation transformer using best grade of available raw material. 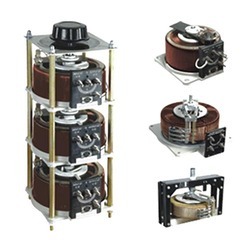 Wide array of isolation transformers are made available by us including ultra isolation transformer, power isolation transformers and high voltage isolation transformer. 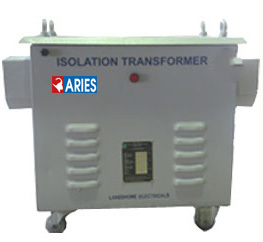 Incorporated with features including robust construction, long, trouble-free service life, flawless performance and more energy saving, the range of isolation transformer is effective to stop disturbances generated by the noisy equipment load from being injected into the power line. We offer comprehensive array of ultra isolation transformer such as power isolation transformers and high voltage isolation transformer. These ultra isolation transformers are effective to isolate sensitive equipment from line voltage transients, spikes & D.C leakage. Our collection is specially designed for sensitive critical equipment such as computers & peripherals, digital communication telemetry systems, medical instrumentation, CNC Machines and others. The ultra isolation transformer is effective in stopping disturbances generated by the noisy equipment load from being injected into the power line. Multiple shielding techniques is employed to reduce inter winding capacitance to below 0.005 Pico farad and increase D.C Isolation to over 1000 Mega ohms. VARIAC is a continuous Variable AutoTransformer, having a single layer winding on a Toroidal Core( Donut-Shaped ) CRGO Stamping ( high-grade Cold Rolled Grain Oriented steel). On one side of the copper winding, a special durable contact surface is made. A contact holder arm with specially selected high grade carbon brushes slides smoothly on this surface over the winding and taps of a portion of voltage across the winding. Any desired voltage within the Maximum range can be obtained by adjusting the position of the Brush. High grade CRGO stamping is used for making Variac Coils. Purity of copper is 99.99% used for winding the Variac coils. Very smooth & step less voltage control. Wide range of current rating 4 Amp. To 1250 Amp. Power factor distortion & wave form is negligible. Overloading capacity for a short time. Spare carbon brushes provided for select ratings. 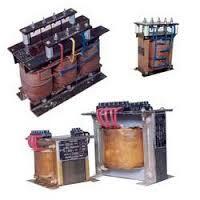 We offer High quality all types of Transformers. Any other Special Application Transformers against request. Coils made from high grade Stampings.